Shadow most senior managers and organizational leaders for a day as they traverse a seemingly endless string of obstacles, interruptions, and minor and major crises, and you will be justified in wondering how they do it. Absent from the daily firefighting is time for contemplation of the larger issues and big decisions. That's a shame because it is our ability to deliberately focus on those issues and cultivate creative solutions that allow our organizations to flourish. However, with the investment of only 20 minutes of quiet time during your day, you might just be able to regain control of your priorities and enhance your effectiveness as a manager. The daily demands our world of work require us to draw more upon our survival skills and the fast-thinking, automatic response center of our brain. From team members looking for input to being called in to navigate an emerging crisis with a customer, every day seems to take on the tone of the nightly news. If the emergent issues weren’t time and energy consuming enough, too many of us allow our time allocation to be dictated by others via control of our calendars. I regularly audit the calendars of coaching clients and typically find that more than half of the time in a typical week is spoken for by recurring meetings scheduled by others. Most of these meetings are status updates that can easily be eliminated with a little discipline. For some of us, the daily drill becomes a comfortable pattern that keeps us engaged and involved. Unfortunately, we are engaged and involved at a transactional level and once again, those larger decisions and looming issues are pushed to the back of the line. For those who become addicted to the daily sprint, time spent in contemplation of the larger issues almost seems like cheating. Chance are, managerial or leadership role is an improper use of their skills and interests. For conscientious leaders who understand they must find time to deal with those topics, the lack of time to deal with them is frustrating. It’s time to seize control of yourself, your priorities and your daily activities. Increasingly, top leaders and rising managers in organizations large and small describe the benefit of carving out a dedicated time in their daily lives for quiet contemplation and introspection. From the practice of meditation, or mindfulness, your ability to silence your mind and focus carefully on either something positive or nothing at all, sets the tone for a more controlled day with the emphasis on the right issues. While you might discount this practice as some fad intended to sell books and training, it turns out there’s plenty of science supporting the benefits of focused time or meditation. At a basic level, the brain has a number of different control centers that support our survival. One system manages the many routine tasks of living, and we don’t spend much time at all conscious of this system’s activities. Another portion of the brain owns our response to danger and triggers the appropriate chemical and physiological reactions necessary when faced with an issue. When stimulated, this portion of the brain seizes control, suppressing the more deliberate, executive center where higher order thinking takes place. The executive center of our brain is responsible for slow, deliberate thinking. It's where we generate ideas, solve problems and deal with the big issues. Unfortunately, it has limited capacity and is quickly shut down by distractions. It takes effort to engage this part of the brain and reap its amazing capabilities. The work of focusing on breathing for example or simply clearing our minds allows this executive center to emerge, pushing that important but obnoxious automatic system into the background and suppressing the negative emotions that trigger fight, flight or freeze. The process of focusing and drawing upon this center supports a positive rewiring to emphasize higher order thinking. 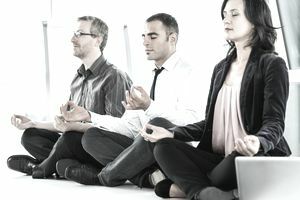 A search on the term mindfulness will uncover a variety of resources applicable to business professionals. However, in the interest of helping you right now, here are four ideas to help you get started in seizing control of your day and improving your effectiveness as a manager or leader. First, build a short block of time into your daily routine. If necessary, set your alarm for half an hour earlier and after you are awake, find a quiet location and deliberately eliminate distractions. My advice is to avoid your smartphone or e-mail until well after your brief period of contemplation or meditation. Try clearing your mind and focusing on your breathing. If stray thoughts trickle in, push them away and resume your concentration on your breathing. Do this for twenty minutes. This deliberate focus fires the neurons in your executive center and strengthens the connections for your use of the center in your daily life. Invoke your “Wise Advisor” to consider your recent actions and outcomes. Think about someone you are struggling to deal with and ask yourself: “What motivates this person?” Or, focus on one problem and ask yourself, “How might someone else view this problem?” Be careful to focus on just one issue per session. Another variation involves replacing your negative thoughts on coworkers or problems att work with more positive perspectives in order to alter your approach. Regardless of what you do to press the pause button on the chaos and noise around you, the fact that you do it will pay dividends in terms of improved mood and attitude and an increased ability to focus on priorities. Additionally, many leaders report doing a better job engaging with and guiding team members. Develop the discipline to turn off the noise and focus internally, and you will be better prepared to not only survive but thrive.